Kia can't stop launching new products and now they've announced that a Soul EV is in the works for next year. But shouldn't we just call this car the Electric Soul and have a massive promotional tie-in with Lenny Kravitz or someone? Kia is slim on details on range, when exactly we'll see photos of the all-electric Soul and when exactly it'll hit dealerships. (My guess is it'll be unveiled at the green-friendly Los Angeles Auto Show later this year, it'll look just like the gas-powered Soul and it will fall within range of the Nissan Leaf.) They describe it as "a car that is as efficient as it is fun to drive." But let's get back to marketing. Soul EV is just...meh. Call this thing the Electric Soul because it's just on that border of catchy and gimmicky. And instead of hamsters again, can't you just imagine Erykah Badu or Janelle Monae driving down a dark street in a Kia Soul EV, then she turns on some funky music (cut to shot of touchscreen and all the available apps), and as she's driving down the street, each of the streetlamps turns on one by one? And then the voiceover: "My Soul...is electric." Kia logo in the middle, MSRP right underneath, fade to black. I'll take that consultancy fee when you're ready, Kia. Before you run and call this another compliance car, Kia wants you to know that they care just a little bit about the environmental factor. "It's to showcase the brand as environmentally conscious," Kia's vice president of marketing, Michael Sprague, says. It also makes sense from a sales perspective as well. 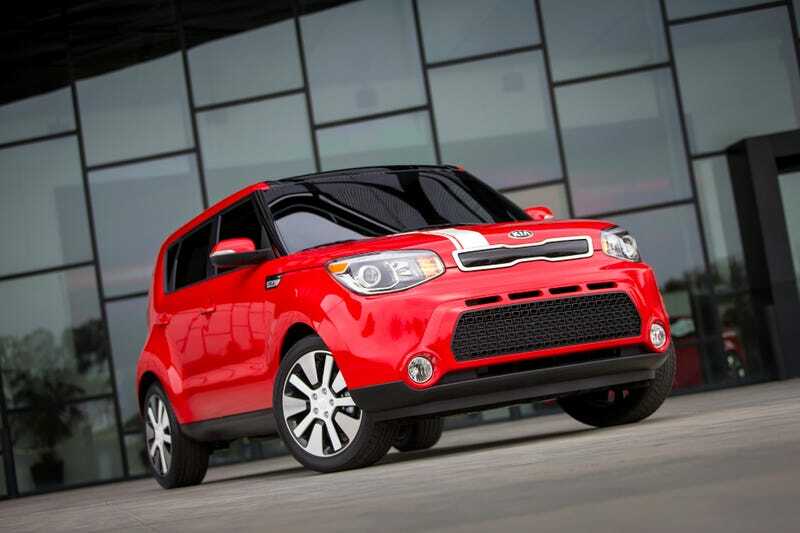 The Soul is one of Kia's best-selling models with more than 10,000 units a month. Considering that many EVs have launched on new, unfamiliar models (see: the Chevy Spark EV, the Leaf, the Volt), adding that powertrain option to a nameplate familiar to the buying public is a safe bet.